Are you facing a required minimum distribution from your traditional IRA? A qualified charitable distribution could help you reduce your taxable income. You must be 70½ years of age when the gift is transferred. Total charitable distributions can’t exceed $100,000 per year, per IRA owner. Distributions must be made directly from your IRA to a qualified charity. The gifts cannot be used to establish a charitable gift annuity or fund a charitable remainder trust). You cannot make a qualified charitable distribution from a SEP-IRA or SIMPLE IRA. Talk to your tax or financial advisor about whether a qualified charitable distribution is right for you. “Love the prairies? Thank a rancher and eat a steak!" is a bumper sticker that can be seen in convention center parking lots across the western U.S. these days. The message is not unexpected on dusty ranch pickups and battered Suburbans, whose drivers are attending annual meetings of the state Cattlemen's Association or Farm Bureau. But just as often, the proclamation leaps out from the bumpers of mini Coopers and hybrid vehicles also sporting logos of The Nature Conservancy, World Wildlife Fund and Audubon Society. Drivers of the vehicles are attending scientific conferences on arid land conservation or workshops on food security, social justice or rural sustainability. The stickers hint at what conservation scientists and practitioners across and beyond Colorado have come to understand: Aldo Leopold was spot on in 1933 when he asserted that wildlife and wildlands "can be restored by the creative use of the same tools, which have heretofore destroyed it – axe, plow, cow, fire and gun." As San Isabel works to conserve land health, wildlife, open space, flowing water and scenic beauty, we recognize the crucial role of sustainably managed ranchlands. When we create or champion opportunities for ranchers to thrive by strengthening working wildlands, the result is cost-effective conservation. Dave Pratt of Ranching For Profit is a leader in helping ranchers transform their operations for long-term sustainability through wise planning for both profitability and environmental health. Dave has graciously allowed us to repost his recent article that posits: "In the real world, a farm or ranch isn’t sustainable if it isn’t profitable." The same can be said of land trusts. Whether you drive a ranch rig or an electric car, the challenge is to do good (for nature and for people) while doing well (environmentally and financially). Maybe it’s just semantics, but I think the words we choose are important. Forty years ago, when I was in college, “sustainable agriculture” was a revolutionary concept. Forward-thinking universities created Sustainable Agriculture Departments. Most farm and ranch kids enrolled in the Animal Science or Crop Science programs while the hippies enrolled in Sustainable Agriculture. Read more here. 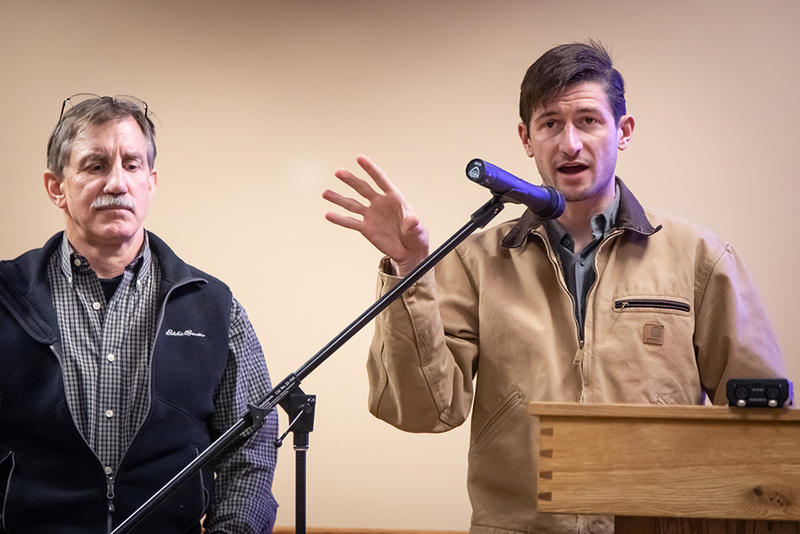 Thanks to Greg Peterson of the Colorado Ag Water Alliance and Phil Brink of the Colorado Cattlemen's Association Ag Water Network for their information-packed presentations on community watershed planning in rural and agricultural communities in Colorado and the resources available to make it happen. Learn how rural, mountain communities across Colorado are dealing with water shortages, buy-and-drys, augmentation plans and other water-related issues at a special presentation by the Colorado Cattlemen’s Association Ag Water Network and the Colorado Ag Water Alliance. The presentation, sponsored by the San Isabel Land Protection Trust, will be from 6:30 to 8:30 p.m. Feb. 7 at the Cliff Lanes/Rancher’s Roost community room, 25 Main Street in Westcliffe. It is free and open to the public. You might not notice them. But our volunteers play a vital role for San Isabel Land Protection Trust. In 2018, they donated nearly 1,500 hours. The many ways they give to San Isabel is humbling and heartwarming. Bobcat! There’s a bobcat in the yard! Staccato barking from my dog Keli woke everyone in the house at dawn on a recent November morning. Normally quiet and cheerful, Keli had anxiously whined and paced through the night between dark windows that overlook my untamed yard of scrub oaks, aspens, pines and firs. Living on a toe slope of the Sangres, all kinds of wildlife abound just the other side of the windows, providing endless entertainment for my whippet/Australian shepherd sidekick. In response to our invitation to participate in our recent strategic planning effort, Randy Woods, San Isabel's first president, sent a letter offering his insight into our organization’s history and graciously allowed us to share it with you. 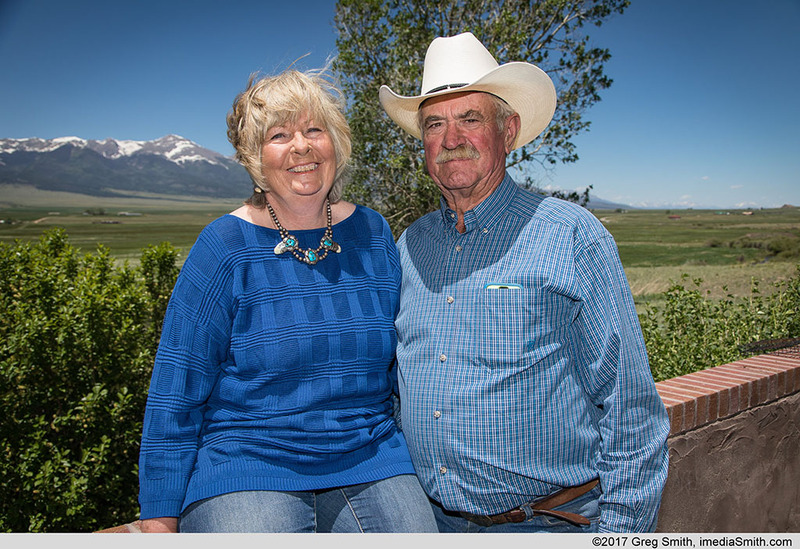 In 2014, Kathi and Jack Thomas found their dream home in the Wet Mountains east of Westcliffe. But just two short years later, that dream went up in smoke in the Junkins Fire, an 18,000-acre conflagration that erupted in the early morning hours pushed by hurricane-force winds. The fire destroyed the Thomases’ home and burned about 200 acres, much of it under a conservation easement with San Isabel Land Protection Trust. But they didn’t give up on their dream, and they didn’t give up on the land. San Isabel Land Protection Land Trust would like to clear up any confusion about land preservation and our most commonly used tool, conservation easements. Our goal is simple: Protect land, water and wildlife while there is still time. San Isabel Land Protection Trust would like to thank all who contributed to the success of the 2018 Art for the Sangres – our talented artists, hard-working volunteers and generous sponsors and patrons. Celebrate art and nature at the 22nd annual Art for the Sangres, a fine art sale that supports vital land protection efforts in southern Colorado. 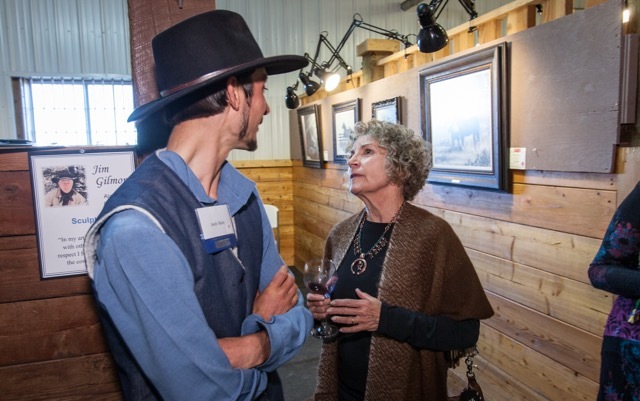 Art for the Sangres takes place in a refurbished barn at beautiful A Painted View Ranch just outside Westcliffe at the foot of the Sangre de Cristo Mountains, offering a stunning fall backdrop for this special event. The 2018 edition of the show features 11 returning favorites and 10 new artists. The sale and reception will be from 5 to 8 p.m. Saturday, Sept. 29. Southern Colorado is poised on the cusp of transformative change. In the short time I've been here, I've seen drought, extreme winds, torrential downpours, flash floods and ferocious wildfires. Noxious weeds endanger biodiversity and ecosystem function. Water transfers and development pressures continue to require very careful planning and stewardship to avoid disrupting our wildlife and scenic beauty. We have big challenges and tight timelines ahead as we work together to sustain this place we love so much. This summer, San Isabel has enjoyed the hard work and very enjoyable company of stewardship intern Olivia Baxter, a recent graduate of Colorado State University with a bachelor’s degree in Ecosystem Science and Sustainability. 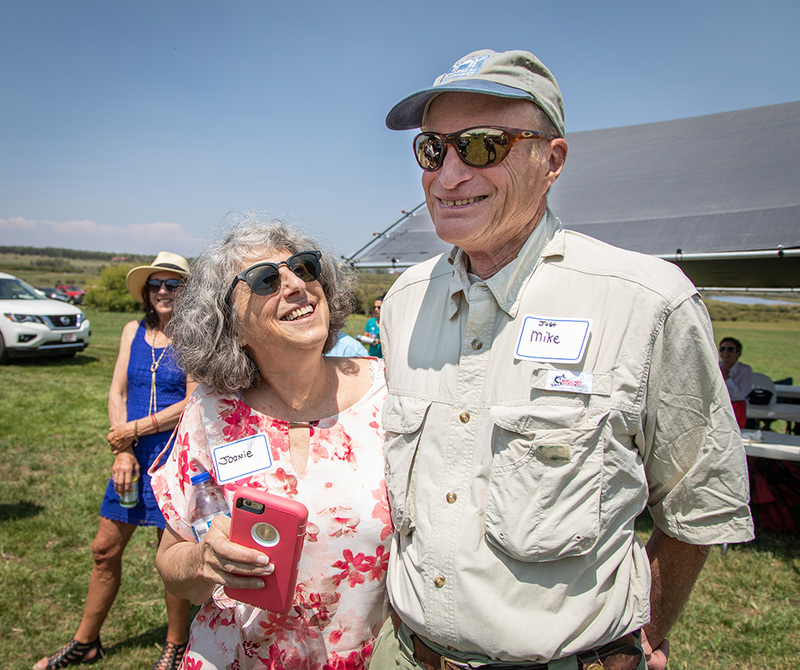 San Isabel Land Protection Trust named Mike Liebman its Alice Proctor Outstanding Volunteer of the Year at the land trust’s annual member appreciation event Aug. 12 at the Ruzanski Ranch near Westcliffe. 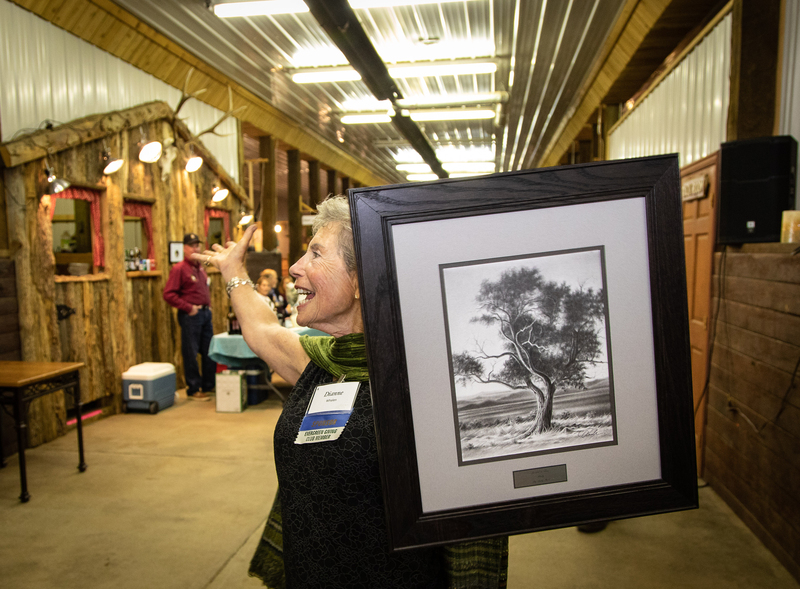 The event brought together more than 140 people, who celebrated the Land Trust’s 23 years of conservation work. The Ruzanski Ranch has been protected by a conservation easement since 2003. 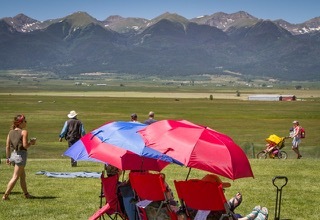 WESTCLIFFE – The arts take center stage in this iconic mountain town in late September, with two premier events and a celebration of the arts for all ages. 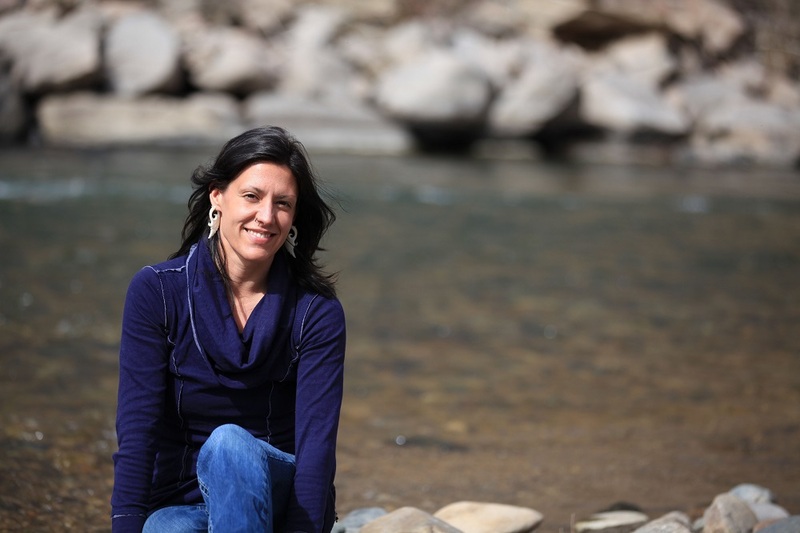 Linda Poole has been named San Isabel Land Protection Trust’s new executive director. Our sixth annual Hardscrabble Mountain Trail Run was a wonderful event Saturday thanks to our runners and walkers, the friends and family who came to Bear Basin Ranch to cheer them on and our generous sponsors. We are particularly grateful to Amy Finger and Gary Ziegler for hosting us at beautiful Bear Basin Ranch on a glorious June day. (Friday's winds died down, and much appreciated rain held off until Sunday.) More than 250 runners and walkers participated, including dozens of young people ages 17 and under who ran for free. To see more photos, click here. 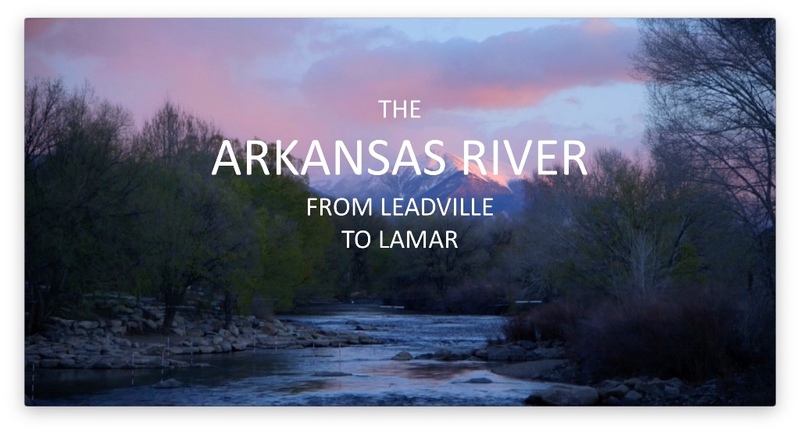 San Isabel Land Protection Trust and the Upper Arkansas Water Conservancy District invite you to a special screening of a new documentary, "The Arkansas River: From Leadville to Lamar." 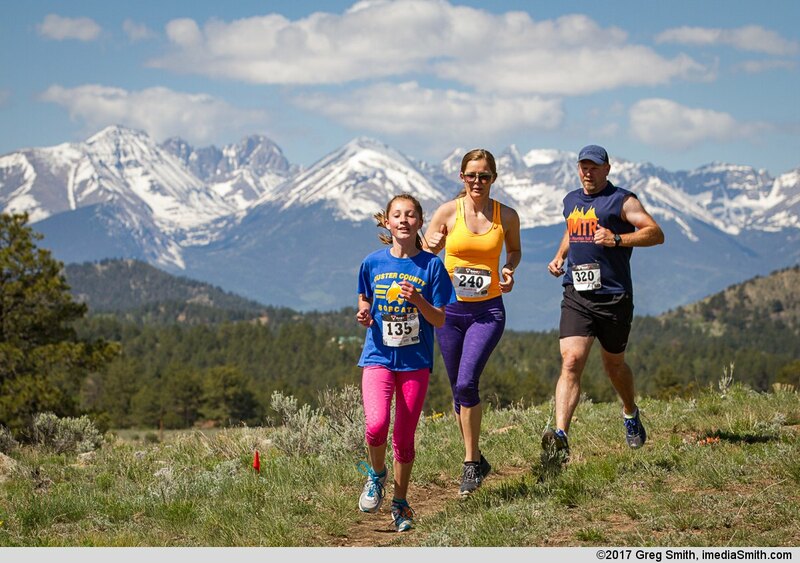 Connecting people to the land lies at the heart of the Hardscrabble Mountain Trail Run, an outreach and fundraising event for the San Isabel Land Protection Trust. 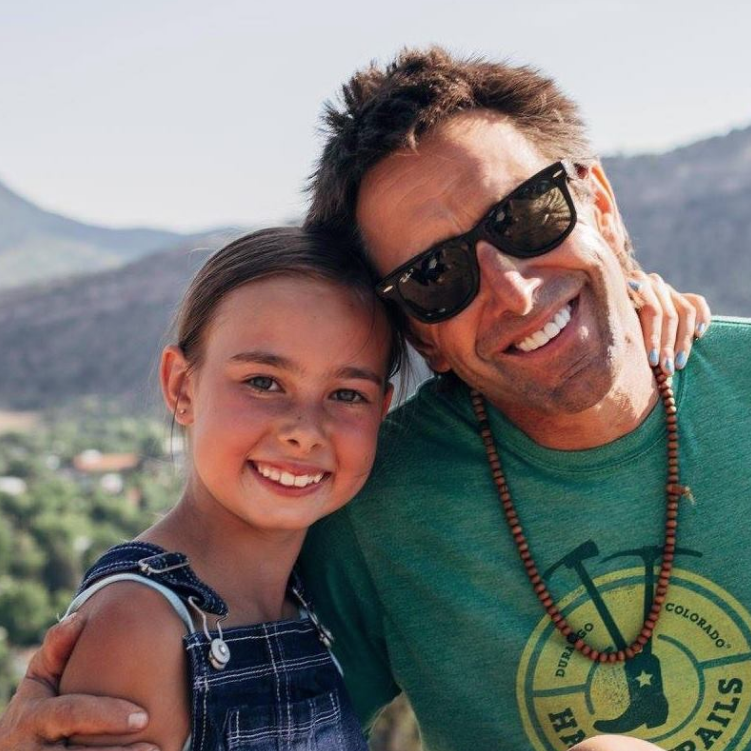 Such connections are drawing acclaimed adventure athelete, coach and author Steve Ilg and his family to this year's event. 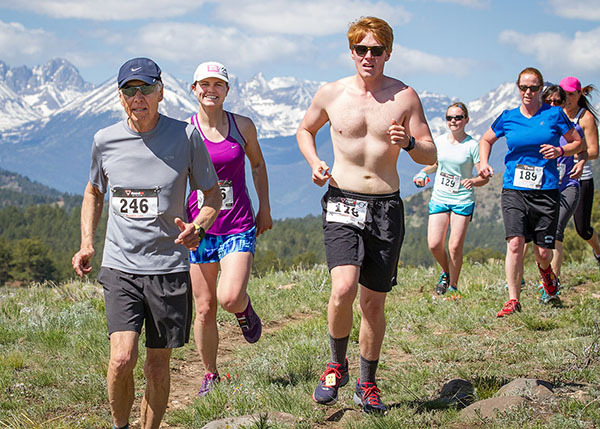 The sixth annual Hardscrabble run takes place at 10 a.m. Saturday, June 2, on Bear Basin Ranch, a 3,400-acre protected ranch just east of Westcliffe. San Isabel Land Protection Trust seeks a stewardship and outreach intern to contribute to its land conservation and stewardship mission this summer. Start date is May 5; end date is Aug. 5 (flexible). To learn more, click here. 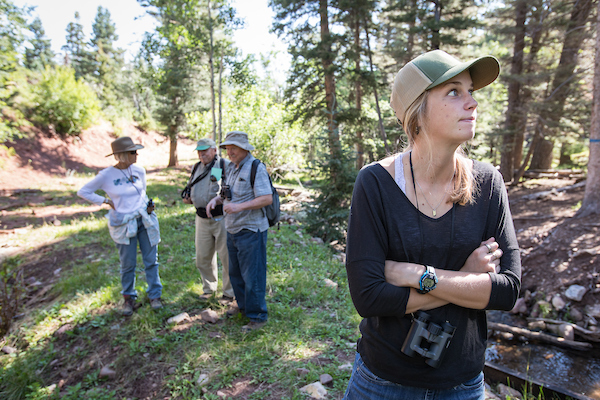 Last summer's intern, Veronica Travers (third from right), on a bird outing at Music Meadows Ranch. San Isabel Land Protection Trust, in partnership with the Coaldale Alliance, is working to complete a precedent-setting agreement in the Upper Arkansas River Basin to ensure good stewardship of the CB Ranch following dry-up. There are as many reasons for giving as there are people who give. What connects you to the land? Why is protecting our land, water and wildlife important to you? Why do you give to San Isabel Land Protection Trust? An important part of our mission at San Isabel Land Protection Trust is facilitating parks and trails in our communities. 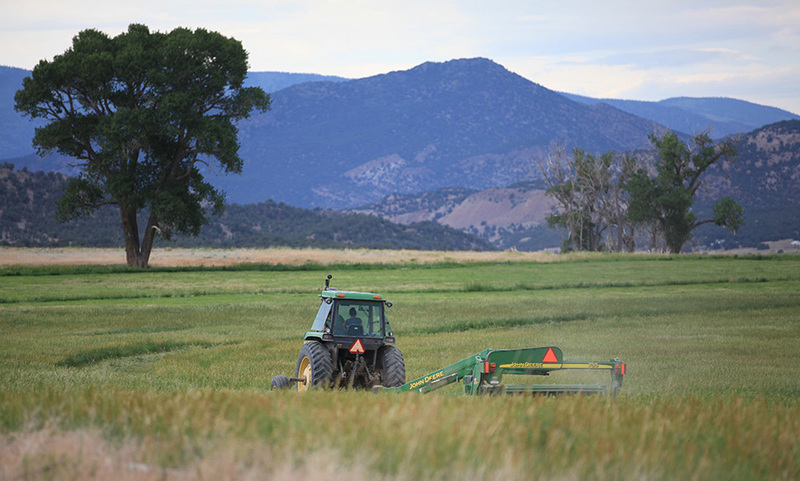 Connected communities encourage new development in areas more conducive to growth, taking pressure off the agricultural and open lands that define our part of Colorado and enhance our quality of life. 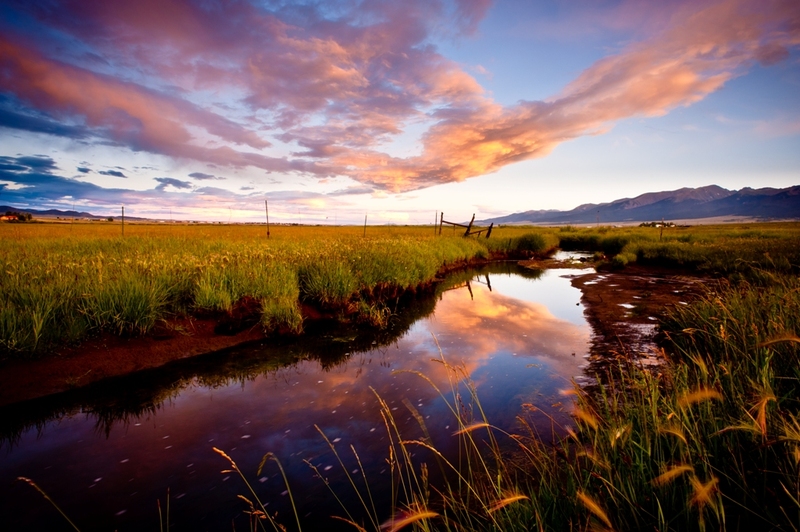 Protecting our scenic farm and ranch lands and open space is central to San Isabel’s overall mission. That’s why we’re involved in the Custer County trails initiative, Trails for All. 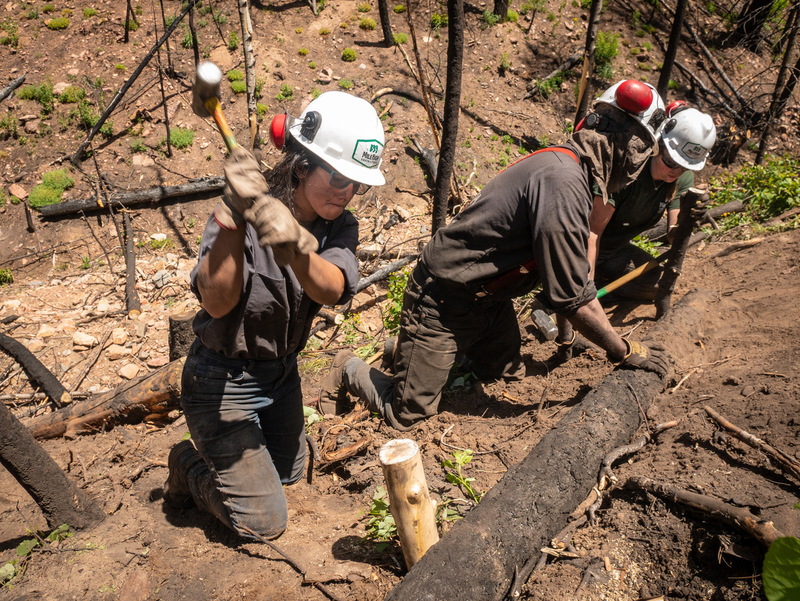 A Mile High Youth Corps crew recently carried out critical wildfire recovery work on a San Isabel conservation property burned in the 2016 Junkins Fire. The crew accomplished a tremendous amount of work in late May and early June on Jack and Kathi Thomas' conservation property. The crew used materials on site to build an extensive series of erosion-control barriers and redirect water flow in an area damaged by heavy rains last summer. This fall, a crew will remove unhealthy trees to improve wildlife habitat and reduce wildfire risk on Music Meadows Ranch. The crews will use removed trees to build erosion-control structures in erosion-prone areas on the ranch. The crews are being paid through two $18,000 grants from Great Outdoors Colorado. Huckleberry Hills Ranch, a 500-acre agricultural property in southwestern Pueblo County outside Rye, has been protected forever by a conservation easement held by San Isabel Land Protection Trust. San Isabel’s board of directors has named fellow board member Chris Skagen interim executive director. San Isabel Land Protection Trust named Vic Barnes its Alice Proctor Outstanding Volunteer of the Year at the land trust’s annual member appreciation event Aug. 27 at the Harold G. Vickerman Ranch. Vic, who until earlier this year had served on San Isabel’s board of directors since 1999, helped lead the land trust through major growth during its first two decades. Kate Spinelli has been promoted to Stewardship Director at San Isabel. The move emphasizes San Isabel’s commitment to working with landowners to protect and care for land and water in Huerfano, Custer, Fremont and Pueblo counties. The land trust aims to ensure the region remains a beautiful and wild landscape with a strong agricultural foundation and a vibrant, healthy community. Join our dynamic and passionate conservation organization and live and work in one of the most beautiful areas of Colorado. San Isabel Land Protection Trust is hiring an executive director. Here in southern Colorado, we value our wild and working open spaces, productive agricultural lands, wildlife habitat and scenic open spaces for what they bring to our quality of life. Many of us are here because of the beauty and because the valley offers a quiet escape from the rapidly developing cities of Colorado and beyond. Colorado’s spending on land conservation returns far more than pretty views, according to a recently released study. It provides a solid foundation for the state’s economic future. 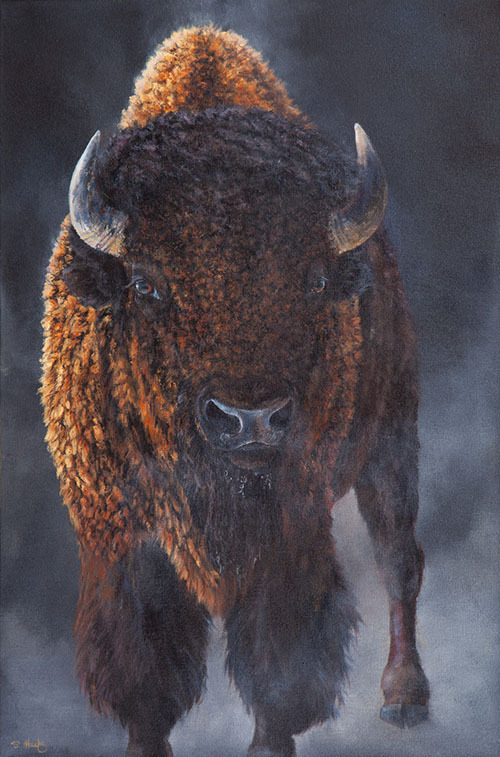 Art for the Sangres enters its third decade of showcasing remarkable art for a vital cause – helping to protect land, water and wildlife while there is still time. The event will be from 4 to 7 p.m. Saturday, Sept. 30, at A Painted View Ranch just outside Westcliffe. 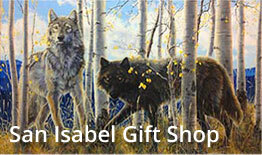 The fine art show and reception is San Isabel Land Protect Trust’s largest fundraiser. The land trust has protected more than 40,000 acres of working ranches, agricultural and forest lands, water resources, wildlife habitat and scenic open spaces throughout southern Colorado. San Isabel Land Protection Trust this summer has enjoyed the hard work and energetic personality of stewardship intern Veronica Travers. San Isabel Land Protection Trust remains engaged in western Fremont County, advocating for the agricultural use of water and ranchland preservation. 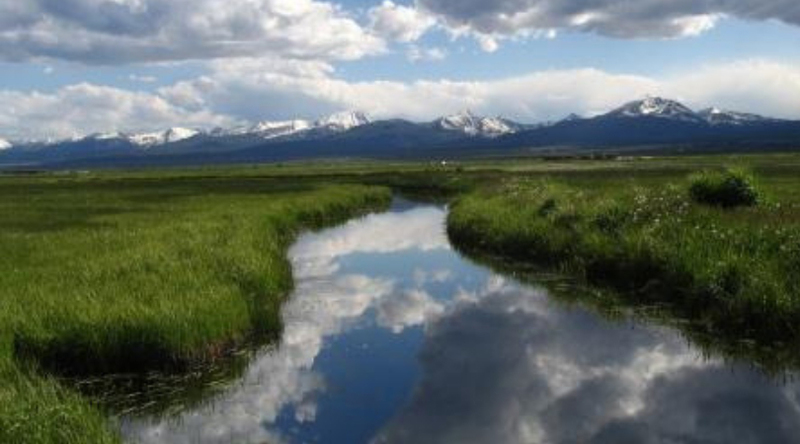 Toward this end, the Gates Family Foundation has awarded San Isabel $210,000 toward purchasing water rights and a conservation easement on the Maverick Ranch, located along the Arkansas River five miles downstream from Salida. San Isabel Land Protection Trust is one of six land trusts selected in the West to participate in a pilot program to develop ways to engage community members in our work and to better engage San Isabel in the community. The program is being developed by the Land Trust Alliance, a national coalition of conservation groups, and will be rolled out across the country. 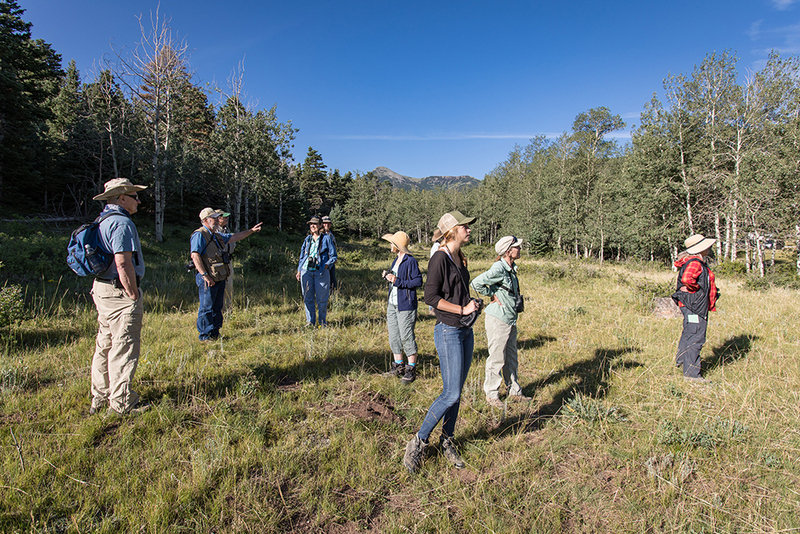 What better way to learn about the bountiful birds in our area than an early-morning walk with local bird enthusiast Leon Bright at beautiful Music Meadows Ranch. 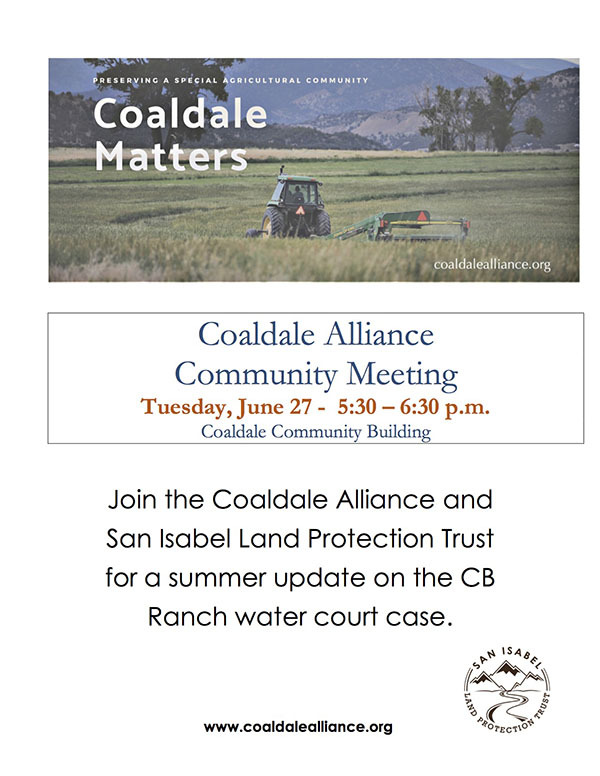 Please join the Coaldale Alliance and San Isabel Land Protection Trust from 5:30 to 6:30 p.m. Tuesday, June 27, at the Coaldale community building for a summer update on the CB Ranch water court case. A special thanks to all who have made a 2017 contribution toward our efforts. We so appreciate you; every dollar counts. You can donate here or mail to SILPT, P.O. Box 124, Westcliffe, CO 81252. Be sure to note that your donation is for the Coaldale Alliance. Randy and Claricy Rusk, Wet Mountain Valley ranchers and conservation pioneers, are this year’s winners of the Stuart P. Dodge Award for lifetime achievement. 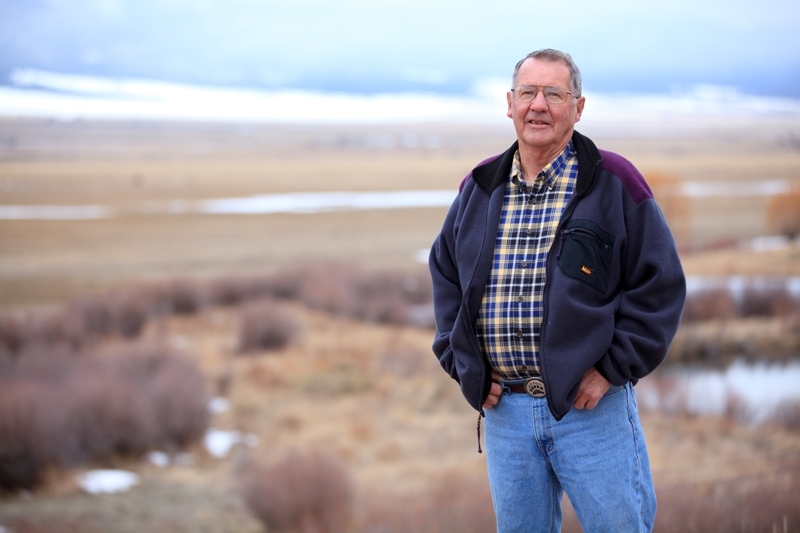 The award, part of the Southern Colorado Conservation Awards presented by Palmer Land Trust, recognizes the Rusks’ vision, leadership and influence in the ranching community in support of land conservation. Greetings as spring speeds toward summer here in the Sangres! May snows and rains left the fields an emerald green, helping a year that's been nothing if not unpredictable. No snow in March! And no new land protected to report. San Isabel extends a big thank you to Vic Barnes for nearly two decades of service on our board of directors, most recently as vice president. Vic had served on San Isabel's board since 1998. We’re happy to report Vic will continue to serve on San Isabel’s Land Preservation Committee, keeping his expertise and experience at the table. Thanks, Vic, for 19 years of board service! Joining the San Isabel board are Kristie Nackord, San Isabel’s former development director, and attorney Chris Skagen. Our fifth Hardscrabble Mountain Trail Run was a day to remember thanks to our runners and walkers, the friends and family who came out to Bear Basin Ranch to cheer them on, our wonderful volunteers and our generous sponsors. 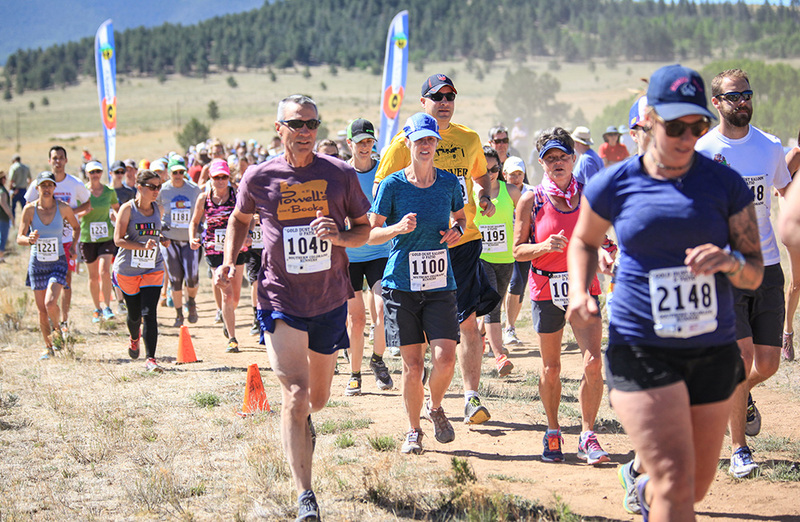 The 5th annual Hardscrabble Mountain Trail Run was a fabulous success thanks to our participants, volunteers, sponsors, and the friends and family who cheered on our racers at Bear Basin Ranch. We couldn't ahve asked for better weather or better folks to spend the day with. You help San Isabel Land Protection Trust protet working ranches and farms, scenic open spaces, clean water and wildlife habitat. A BIG thank you tall, and we hope to see you next year. 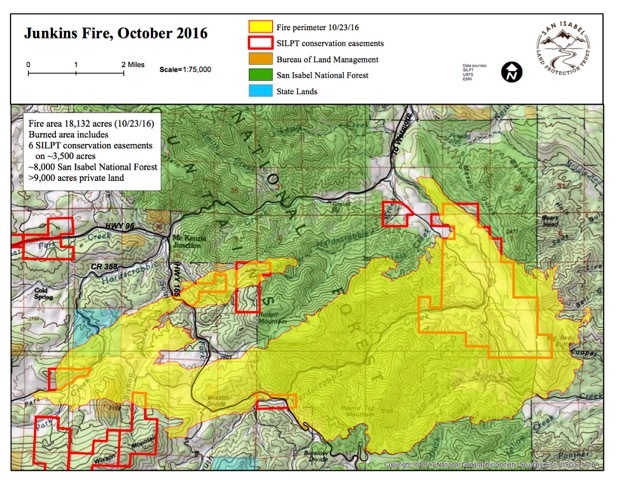 Wildfire changed our landscape and our community last year. As the coming rains wash over burned soils, the fire’s legacy will continue to change the landscape and waterscape for years to come. Much can be done to help alleviate negative impacts on safety, homes, roads and water supply. But we need your help. Learn how to protect your home and property at a community wildfire workshop hosted by local, state and federal officials. 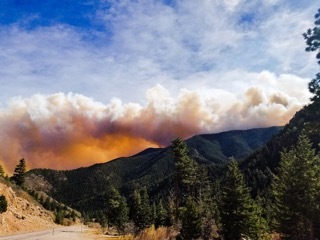 The free workshop will be held from 10 a.m. to 2 p.m. Friday, April 28, at the Wet Mountain Fire Protection District office, 215 Fourth St. in Westcliffe. 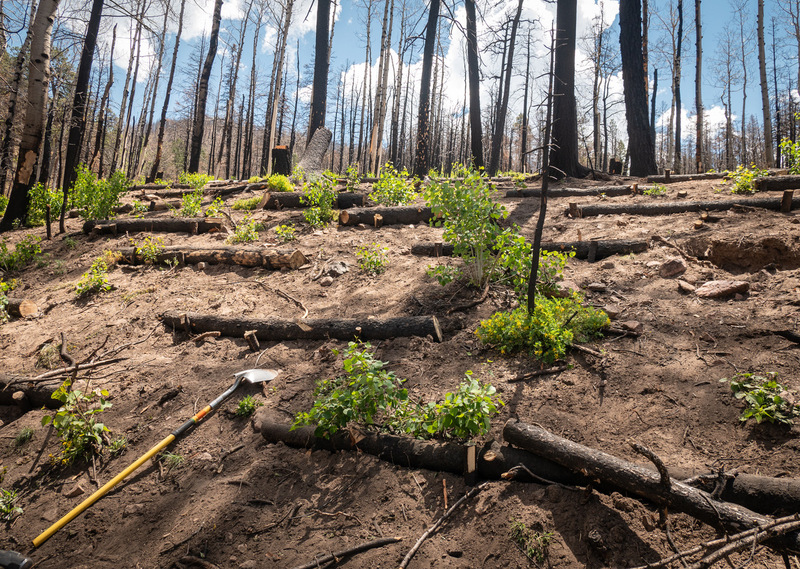 With spring here and the forest beginning to regenerate after last fall’s Junkins Fire, our local community is getting ready for what comes next. The Bluff Park is the jewel of downtown Westcliffe, and San Isabel Land Protection Trust wants to polish it with your help. The Land Trust hopes to create a crew of volunteers – Bluff Stewards – to help with planting and maintaining gardens and landscaping. Think Friends of the Library but with a gardening twist – and a spectacular view. San Isabel Land Protection Trust — with your help — has drafted a new three-year strategic plan that will take us to 2020. San Isabel Land Protection Trust’s efforts to enhance The Bluff Park have received a $3,000 boost from the Colorado Garden Foundation. 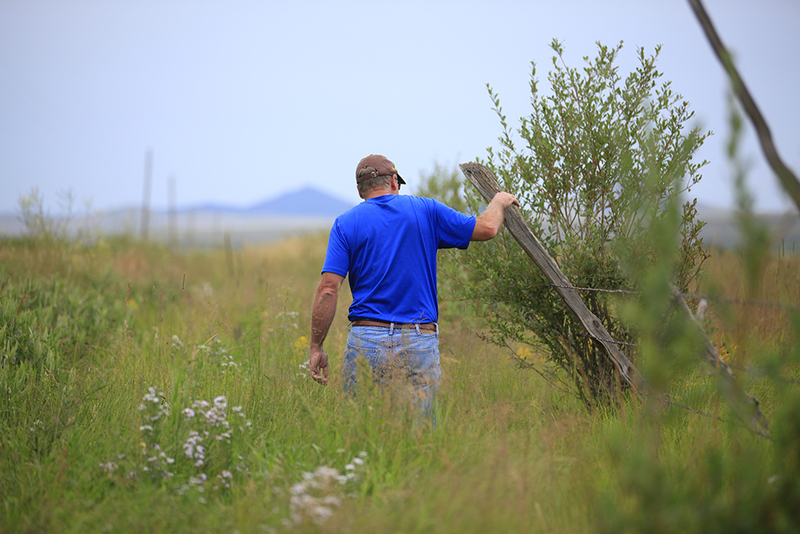 Young people from across south central Colorado will work to reduce fire risk and treat invasive weeds on Duckett Creek Ranch, a protected ranch on the eastern flank of the Sangre de Cristo Mountains near Westcliffe. 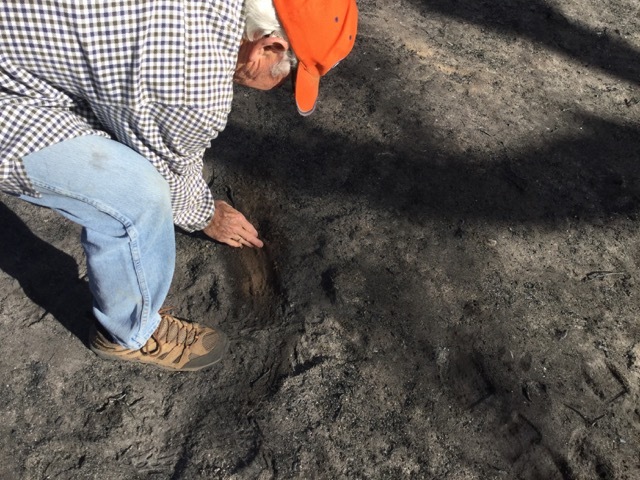 A month after firefighters contained the fast-moving Junkins Fire, San Isabel Land Protection Trust is engaging with landowners and agency partners to assess damage, establish a recovery plan and connect landowners with much-needed resources. San Isabel welcomes Janet Smith of Westcliffe as our new director of development. The 20th annual Art for the Sangres proved one for the record books, tallying nearly $170,000 in fine art sales Sept. 23 and 24. You make a difference for land, water and wildlife! Your support of San Isabel Land Protection Trust shows you care about land, water and wildlife. We hope you will do even more to safeguard our shared legacy. 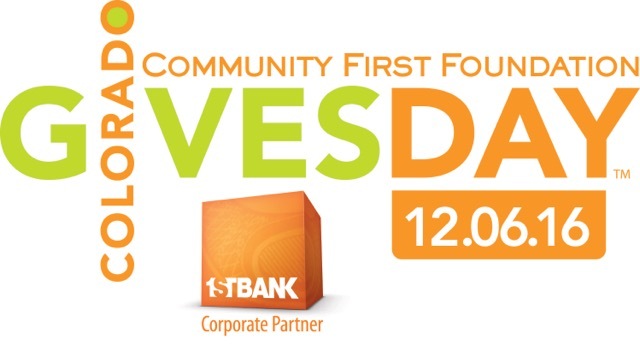 Support San Isabel tomorrow on Colorado Gives Day! Double matching funds are available to make your gift go the extra mile. 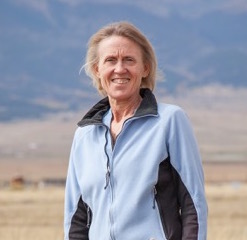 San Isabel Land Protection Trust named Custer County resident Anita Welch its Alice Proctor Outstanding Volunteer of the Year at the Land Trust’s annual member appreciation event Sunday at the Bluff Park. We hope you will join us September 24 for our 20th annual Art for the Sangres fundraiser. The event is a celebration of beauty – art, land and community. The setting: A Painted View Ranch, three miles outside Westcliffe in the stunning Wet Mountain Valley. It could not be more aptly named for the occasion. San Isabel Land Protection Trust is pleased to announce the appointments of Blake Osborn (Cañon City) and Dianne Whalen (Westcliffe) to their 2016 Board of Directors. They wish farewell to outgoing Directors Claricy Rusk, Mary Ellen Lesage and Claudia Cole, and Director of Development, Kristie Nackord. Driving across the Valley floor recently we were greeted with the sweet summer scent of freshly cut grass wafting in our open windows as we cruised past hay field after hay field in various stages of converting green summer pastures into essential winter forage for thousands of cattle, horses, goats, sheep, and probably even an occasional deer and elk. 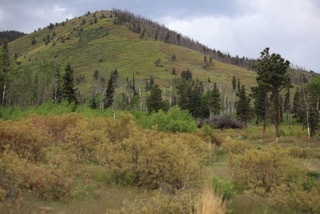 The Great Outdoors Colorado (GOCO) Board awarded a $50,000 grant to San Isabel Land Protection Trust on Monday to conserve Huckleberry Hills Ranch in western Pueblo County. The days are finally warming after a cool, wet spring and here at the ranch we’ve been spending more and more time outside; working the garden, hiking, horseback riding, and generally getting to know the land. Flowers are blooming everywhere. Dandelion, golden banner, blue flag iris, bush honeysuckle, chokecherry, and gooseberry are in bloom along with their more domesticated (but no less beautiful) cousins – lilacs, snapdragons, and old homestead apple trees. Abundant moisture, longer days, and the warm caress of the sun have turned the valley into a lush paradise. 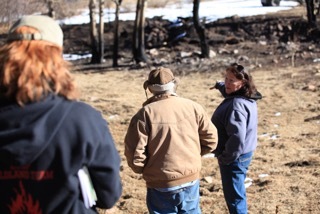 Recently, San Isabel landowners and members joined Curt and Peggy Sorenson at their Garden Park property in northern Fremont County to hear their story of a very successful public-private collaboration for forest restoration. If you are a member of San Isabel Land Protection Trust, we invite you to join us and our hosts, Curt & Peggy Sorenson, to tour their protected land and hear the Garden Park story of public-private collaboration for land restoration. Spring is here! Vast greening hay fields provide a striking contrast to the still snowy-white mountains. Crocus and hyacinth poke their diminutive flowers above the soil in local gardens, and their wild cousins the Pasque flowers are doing the same in the open meadows. Days have lengthened, and the sun’s rays melt the ice off the ponds, inviting Blue Herons, geese, and ducks to take up residence in their search for promising nesting areas. It smells of sun-warmed pine trees and freshly turned dirt. Recently I attended the Conservation Excellence Conference hosted by the Colorado Coalition of Land Trusts at the University of Denver. There I participated on a panel discussing a suite of innovative water management solutions to secure water for people and nature. We'd like to introduce you to Michael Banz and Kathy Blaha, long-time friends and members of San Isabel Land Protection Trust and founding members of our Evergreen Giving Club. We recently asked them why they give to San Isabel. Below are there answers. Join San Isabel Land Protection Trust and the Custer County Chamber of Commerce for community coffee and light breakfast on Wednesday, April 13 from 9am - 10am. There’s nothing more quintessentially “American West” than the high lonesome sound of a coyote yipping across the sagebrush hills at dusk. Coyotes are plentiful here in the Valley and are seen often, roaming fields and forests. Although coyotes are at home in the remotest areas of the Mountain West, few wild creatures have adapted as handily to human presence and coyotes have been spotted in areas as highly populated as New York’s Central Park. At the end of 2015, San Isabel Land Protection Trust helped two families realize their dreams of protecting their land. 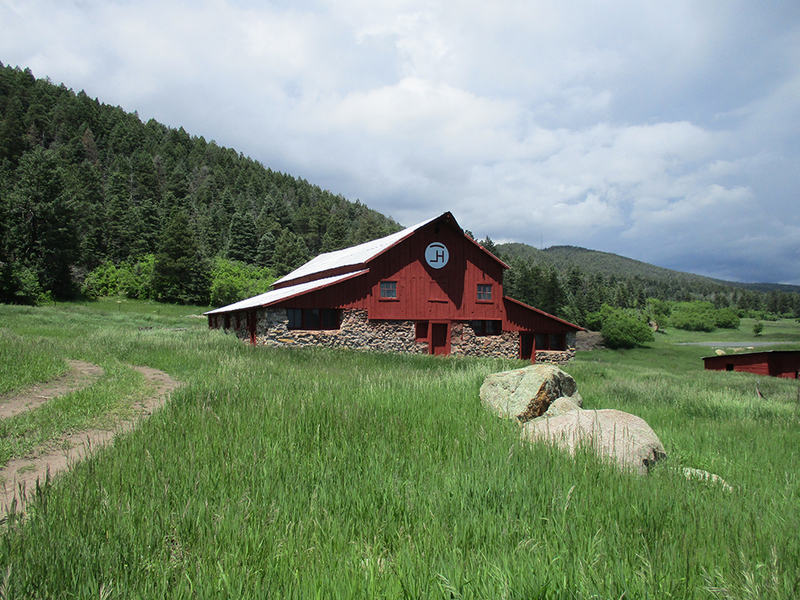 Both properties lie on the forested eastern flank of the Sangre de Cristo Mountains, adjacent to the San Isabel Forest in Custer County. Now, critical wildlife habitat and forest land will be protected, forever. San Isabel Land Protection Trust is offering a forest health workshop on Thursday, February 18, covering topics such as local forest history, pests and diseases, and more. The workshop will be located at Second Street Café in Westcliffe and is hosted by San Isabel Land Protection Trust in partnership with Colorado State Forest Service, United States Forest Service, Colorado State University Extension and the Custer County Conservation District. On cold, clear winter nights high in the Rocky Mountains, silence reigns. The brilliant crystal clarity of the stars cast soft shadows over the snow-covered landscape, and not even the faintest sigh of a breeze disrupts the utter stillness. On these nights, the quiet is only broken by the haunting call of the Great Horned Owl. One could aptly quote “The Rime of the Ancient Mariner” by Samuel Taylor Coleridge when observing the snow­capped mountains and rushing rivers of Colorado. A few weeks ago, we lost a few chickens. The first one didn’t worry us that much. Sometimes you lose chickens to predators. It’s just the way it goes. But after we lost two in one day, we closed our free ranging chickens into the safety of their coop and waited to see what would show up looking for more easy prey. In June of this year, I accepted the position as Board President of San Isabel Land Protection Trust. I am honored to work with a group of talented individuals and consider myself very fortunate to have this opportunity to be part of furthering Colorado land and water conservation. I would like to extend a special thanks to our board members, staff, members and volunteers, for their hard work and commitment over the last 20 years. Help San Isabel attract a buyer for the Claret Canyon Ranch, a beautiful 335-acre protected property in southern Fremont County. The sellers of this gorgeous ranch have offered San Isabel a generous finder’s fee if we find a buyer. Will YOU help us? Driving north on Highway 69 recently, we were enjoying a typical Colorado bluebird morning. The newly snowy mountains rose high above hay feels still tinted green, the snow blindingly white against the cloudless cerulean sky. Willows glowing gold with the last of the fall color wound through the meadows and past the highway following creeks edged with ice. The morning air was crisp, but the sun’s rays were warm, hinting at the pleasant afternoon to come. As we neared Beckwith Ranch, three very large raptors caught our eye, circling lazily, their heads as snowy as the mountains to the west. The bald eagles are back. Congratulations Dr. Curt Sorenson for winning the 2015 Southern Colorado Conservation Award for Stewardship! Congratulations to Dr. Curt Sorenson for winning the 2015 Southern Colorado Conservation Award for Stewardship! We applaud your efforts for spearheading the largest collaborative forest restoration project in the region. San Isabel Land Protection Trust invites the community to a private viewing of The Great Divide, a feature length documentary film from the Emmy award-winning team of Havey Productions. A couple of weeks ago I was standing in the front yard taking in the glory of the Milky Way spanning the night sky when I heard a sound I hadn’t heard before. A bit eerie (particularly in the dark), it took me a minute to realize I was listening to one of the quintessential sounds of Fall in the Colorado high country– an elk bugle. 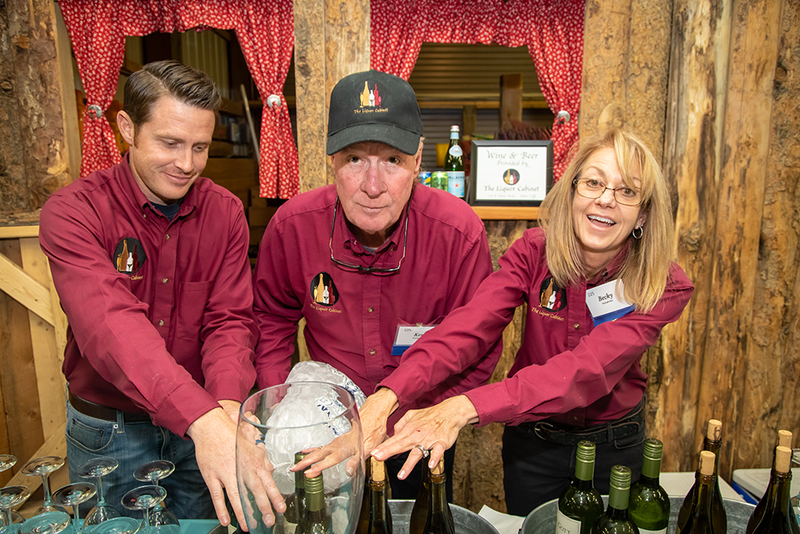 Nearly 300 guests over the course of two days enjoyed fine art, food and wine during the 19th annual Art for the Sangres at A Painted View Ranch. 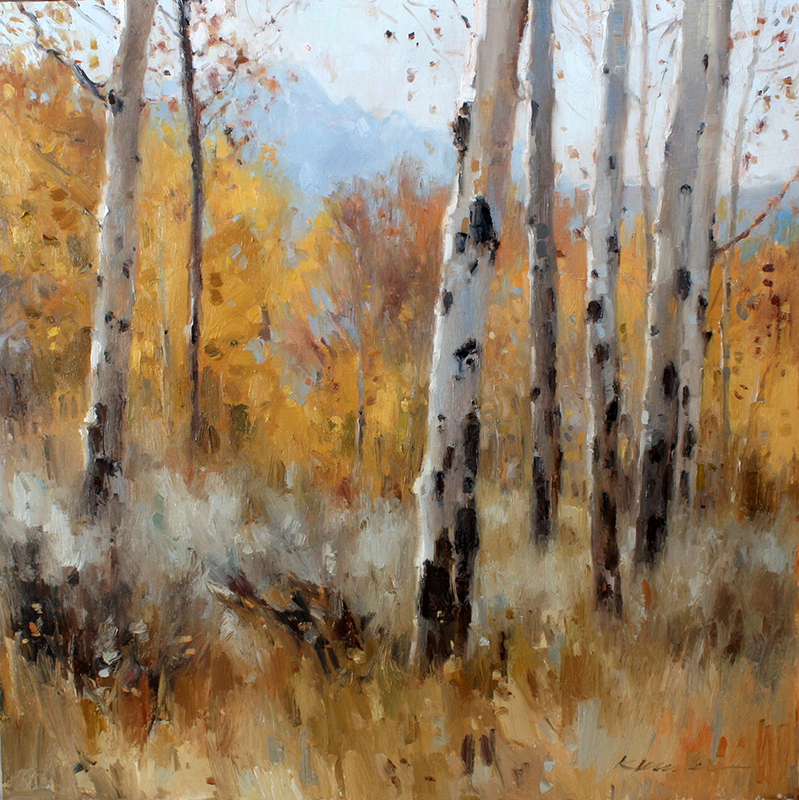 Over $147,000 in art was sold during the event, 40% of which supports conservation efforts in Southern Colorado. 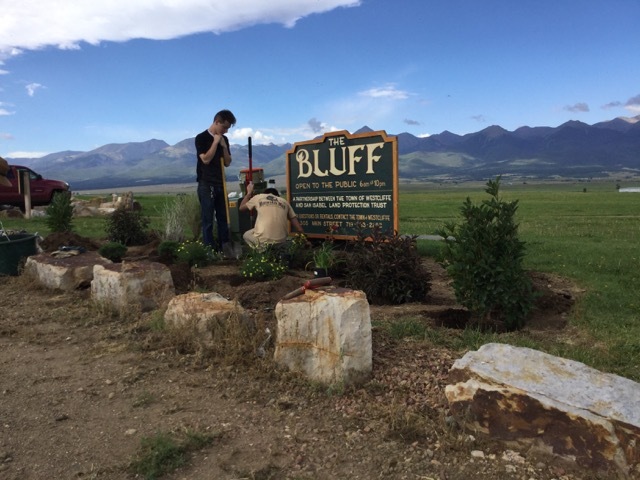 For 10 days out on the Bluff Park in Westcliffe residents and visitors alike might’ve seen a crew wearing yellow hard hats. Those belonged to the Southwest Conservation Corps who were working to fix erosion issues at the Park. A team of artists from across the country and beyond will help paint a brighter future for land conservation this Saturday during the 19th Annual Art for the Sangres at A Painted View Ranch near Westcliffe. Last weekend was Labor Day weekend - unofficial end to the summer. While the valley is still lush, green, and warm, hints of fall are beginning to nudge away the lazy summer days. We recently moved residences, and looking out our new window at a bush I saw one lone branch sporting leaves that had turned crimson red. San Isabel Land Protection Trust (San Isabel) was recently awarded a $382,700 grant from Great Outdoors Colorado (GOCO). The money will go toward the purchase of a conservation easement on 2,051 acres of Redwing Ranch in Huerfano County. Once slated as the site for a high rise hotel, The Bluff Park is now protected forever thanks to a conservation easement donated by San Isabel Land Protection Trust to Colorado Open Lands. The big tents were up on The Bluff this past weekend, this time to celebrate San Isabel Land Protection Trust’s 20th Anniversary. San Isabel believes an important premise of private land conservation is that private landowners are the best stewards. That’s why the land is productive, full of wildlife, beautiful and worth protecting. However, over time, we suffer droughts, invasions by different weeds, forest pests, and other challenges. San Isabel would like to support our landowners in facing these challenges. San Isabel is pleased to announce the appointment of Larry Vickerman as Board President. 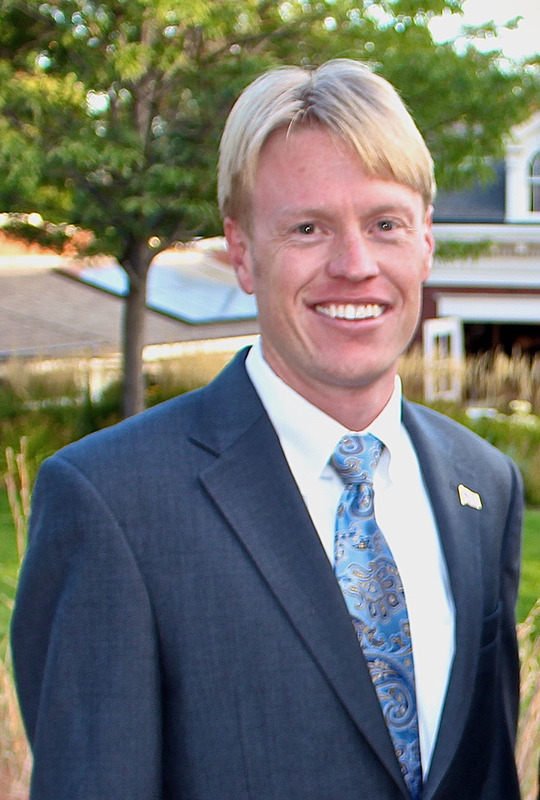 Also joining the board of directors in 2015 is Woody Beardsley. Summer has finally arrived in the Wet Mountain Valley. We've left the cool, wet, cloudy spring behind for long days full of warm sunshine and cool nights full of starry skies. An occasional thunderstorm rumbles through on its way east, dropping more precious moisture and putting on a light show. The clean, bright smell of fresh grass and sunshine mixes with the heady vanilla scent of sun-warmed ponderosa pines. Summer is a season of plenty, and where we live, beauty is no exception. We've “spotted” so much recently; it's hard to pick just one thing to talk about. Henry Watson has joined the San Isabel team as our summer intern. He is responsible for monitoring many of our conservation easements as well as working on special assignments. This morning, Governor Hickenlooper signed Colorado Senate Bill 206 into law, providing greater financial return to landowners who wish to protect their land and water with a conservation easement. Those of us who live here in Colorado love our sunshine. We also love to tout to out-of-staters the frequency in which our beloved sun appears. “We have over 300 days of sunshine per year – that’s more than San Diego and Miami!” We are closer to the sun than most places – our high altitude making those warming rays more intense and allowing us wonderful ‘winter’ activities like bikini skiing (or just snowshoeing without a coat for those of us who aren’t crazy about the idea of snow + bikini). It also means sunscreen or other protection is critical pretty much every day… at least until the past month. In my previous article, “Water Smart Growth – the Key to Colorado’s Future”, I discussed methods for supporting Colorado’s water conservation efforts, including the collection and use of rainwater. As a youngster who spent his childhood summers playing in the irrigation ditches at my grandparent’s Southern Colorado cattle ranch, I realized at an early age the importance of water to the health and livelihood of rural Colorado. This has been drawn into even tighter focus during my time working for San Isabel Land Protection Trust. Productive agriculture and ranching is impossible without good water rights. If 2 million Colorado newcomers wind up in suburban developments, water resources in rural Colorado could be in serious trouble. In a typical Front Range suburb, most residents live on large lots with beautiful Kentucky Blue Grass lawns. Kentucky Blue Grass grows great — in Kentucky, where annual precipitation averages 40 inches a year. Here in Colorado, where precipitation is only 14 inches annually, this type of grass requires a lot of supplemental watering. Non-native lawns and trees often require a tremendous amount of water to survive – water that can only arrive by way of water transfers away from productive agriculture. 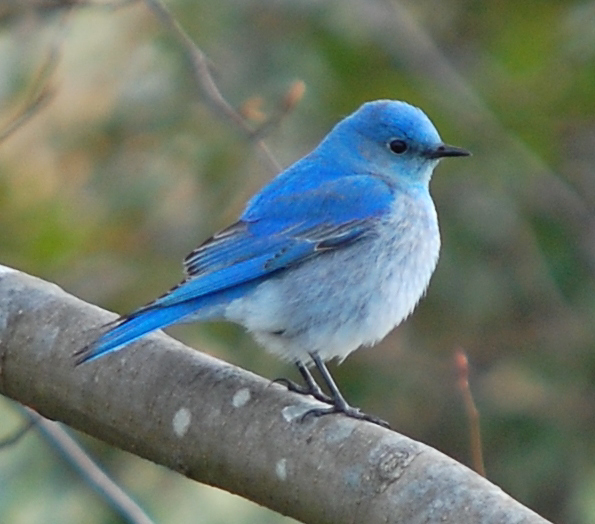 Spring and fall mean bird migration time – and we get plenty of them in the Wet Mountain Valley. Some only stop by for a brief visit. More stay for the summer season, similar to some of our human residents. Bluff Park Workday - -Volunteers Needed! Spring is in the air and San Isabel is gearing up to beautify the Bluff Park for the summer season. Volunteers are needed to dig holes, plant shrubs & flowers, rake, mulch, water plants, disperse seed & pull weeds. This year San Isabel Land Protection Trust celebrates its 20th birthday. Two decades is quite an accomplishment for a small organization with big ambitions. Paradoxically, the success of San Isabel and other land trusts is defined as much by what doesn’t happen, as what does. A local featured artist and a special display by a noted photojournalist will highlight the 19th Art for the Sangres on September 26 at A Painted View Ranch in Westcliffe. Spring has certainly sprung here in the Wet Mountain Valley. Nobody leaves the house without plenty of layers in case a warm spell morphs quickly into a water-replenishing snow storm. Calves cavort in every pasture while ranchers run on little to no sleep making sure calving season goes off without a hitch. Mountain mahogany and wax currant bushes sport brand new buds of greenery, hay fields are carpeted with emerald green, and even the cloud formations are starting to look more like summer than winter.